As I wrote Monday, things have been very hectic around here lately; so much so that I missed Femulate's fifth birthday, which was Monday. So belated Happy Birthday to the blog! Wow! A fantastic blog, Stana. So well done! 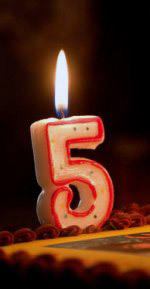 Happy "5" Stana! You don't look a day over "4"!!!! We love you and your lovely creator and writer and our friend, Stana. Go on, have another piece of birthday cake.